If you want to know what grape seed extract is, why people take it, and how it can benefit your health, then you want to read this article. Grape seed extract (GSE) is a cheap and efficient source of potent antioxidants that are otherwise hard to get from food and supplements. These antioxidants stay in your body longer than most and help improve blood flow, protect blood vessels, and are generally great antioxidants. Some say that grape seed extract can reduce food intake, improve testosterone levels, and reduce cholesterol levels, but there’s very little evidence for that currently. Some have called grape seed extract “…one of the most profound and well researched anti-inflammatory compounds…” in existence. Others claim that it can prevent cancer, heart disease, and Alzheimer’s, and improve bone, blood vessel, and oral health. Some say that it’s just another unproven fad not worth worrying about. Well, on the whole, grape seed extract isn’t as effective as it’s often made out to be. It does, however, have several different moderately beneficial effects that make it worth taking. The short story is that grape seed extract can reliably improve blood flow in the body, which is helpful for a number of reasons. It’s not a panacea, but it works and it’s cheap, which makes it a good choice on the whole. Before we get into the science, let’s look at exactly what grape seed extract is. Why Do People Supplement with Grape Seed Extract? How Is Grape Seed Extract Different from Pycnogenol? What’s the Clinically Effective Dose of Grape Seed Extract? Does Grape Seed Extract Have Any Side Effects? What Types of Results Should I Expect with Grape Seed Extract? Grape seed extract (GSE) is a very simple supplement—it’s just an extract made from the seeds of grapes. Seeds are generally highly concentrated in nutrients in general, since they need to support the growth of the fruit and plant bodies, and extracting them further gets a nice bolus of whatever the heck happens to be in grapes. For our purposes we refer to the proanthocyanidins, or PACs for short. You’ve heard of catechins, perhaps? The word comes up a lot when talking about plants, in particular green tea (it’s main bioactive, EGCG, is the catechin epigallocatechin-3-gallate) and dark chocolate (which contains (-)-epicatechin). PACs, by definition, are clusters of catechin molecules smushed together. Catechin is ultimately just a name for a specific molecular structure. The structure of a molecule dictates its actions in the body after all and, more often than not, things that look similar have similar properties. Catechins, generally speaking, are antioxidants that improve blood flow and may have subtle influences on how the mind works. Some are more potent than others, and not all catechins are worth ingesting; it’s a rule of thumb. And grape seed extract is chock full of these PACs. However, that’s pretty much it. It does have many other goodies in there like resveratrol, the “wine compound” of longevity, but at a low 0.53% or (for simplicity’s sake) about 1 mg resveratrol for every 200 mg GSE. Grape seed extract is a supplement that provides various beneficial compounds found in grapes. For the most part this refers to the proanthocyanidins (PACs) but some other minor compounds like resveratrol might be in there. Grape seed extract is usually included in supplements because it’s a cheap way of getting some plant-based antioxidants. Many people want to take antioxidant supplements but, since damn near everything is an antioxidant in some manner and even more things are marketed as such, you have to look at what specific benefits antioxidants might have. Grape seed extract’s niche is that it’s cheap and simple. It’s a convenient source of catechins, basically. It’s not obscenely potent like C60 (another plant antioxidant) and doesn’t have an overly precise and interesting mechanism like N-acetylcysteine or spirulina, it’s more like vitamin C in that it just walks up to the oxidant and mops it up. When scientific revolutions are being made annually and popular supplements brag about their molecular mechanisms frequently, simplicity is pretty nice. Makes things less confusing yet still gets the job done. And, grape seed extract costs only about five cents to put into a supplement, which is one of the main reasons it’s become so popular. There has to be some point where I delve into the specifics as to why you would want to take grape seed extract. So, if it simply works, what simple things can it do? The primary thing that grape seed extract does is improve blood flow. This is due to the vomiting of catechins in the blood stream and how that interacts with nitric oxide, a small signaling compound that relaxes blood vessels and thus improves blood flow. Nitric oxide itself is never supplemented because, much like adrenaline, it has a half life of about half a second. It gets made, does its thing, and promptly dies when it’s oxidized. When nitric oxide is paired alongside antioxidants it can act for a much longer time. Who knows, maybe even three quarters of a second! Still a 25% increase. Ultimately, nitric oxide and oxidation have a sort of balance between each other; too much oxidation reduces the effects of nitric oxide. This is why some disease states, which reduce endogenous antioxidants in your body, increase blood pressure. So, just get something cheap to put antioxidants in your blood and float around for a bit. Nothing fancy, but it works. Over, and over, and over again grape seed extract has shown to generally increase blood flow even at doses as low as 150 mg twice a day. There’s only been one failure at this point in time seen with 300 mg of grape seed extract in untreated hypertension. But what’s also cool is that grape seed extract is associated with reduced leg swelling during prolonged sitting, which occurs with impaired venous blood flow. Usually for venous issues you’d need a dedicated blood flow supplement like horse chestnut, but GSE double dips here on the cheap. This is why we used it in Fortify since, as I elaborated on in my joint health article, people with severe joint pain might not be moving around much. Grape seed extract improves blood flow secondary to assisting nitric oxide signaling and may also double dip by improving venous blood flow. Low-density lipoprotein (LDL) is commonly referred to as the “bad” type of cholesterol, but that’s sort of a misnomer. You need LDL in your body in sufficient amounts and it needs to be able to do its various jobs. Under certain conditions, though, LDL can get oxidized or otherwise damaged which makes it take on a “fluffy” appearance. This is usually what people refer to when they talk about harmful cholesterol, and reducing the rate of LDL oxidation is thought to keep the heart healthy. Of course, anything can be proven to do this outside of the body in in vitro testing (testing done in test tubes, not in people). What we want is stuff that’s confirmed to work after oral ingestion in humans. And this is what we see with grape seed extract supplementation, well, at least two out of three times; people with high triglycerides and smokers saw benefits while those with metabolic syndrome did not. There’s more evidence than not to assume grape seed extract can help reduce oxidation of LDL, which is thought to improve cardiovascular health long-term. While I’ve written previously about the best and worst appetite suppressants, you may note an apparent lack of grape seed extract, even in the honorable mentions. So why am I bringing it up here? Well, one study found a 4% reduction in voluntary food intake after people supplemented with grape seed extract. They didn’t actually see any changes in mood or satiety, so why it reduced food intake isn’t really known. Plus when we look at any other studies on the topic, the closest we can get is grape juice, but that doesn’t influence appetite so nobody knows what happened with the first study. Currently, we have to sort of reluctantly admit that grape seed extract may reduce food intake and it certainly won’t hurt. If you want to lose weight, it’s a good example of something you might want in your supplement regimen without paying much extra. But it’s not like slipping 800 mg into people’s faces and waiting 12 weeks reduces weight or anything. So far, studies haven’t found that it actually helps people lose weight on its own. However, it’s wholly reasonable for a future study to overturn these findings. Happens a lot when you have a single study that isn’t replicated. While grape seed extract has some limited data that it can reduce food intake, it doesn’t really make much sense why it would do this. Much more evidence is required. Grape seed extract contains a molecule known as procyanidin B2, which is actually an aromatase inhibitor. Aromatase is the enzyme that converts testosterone into estrogen. It is pretty interesting since many athletes want to increase testosterone while preventing an increase in estrogen, so inhibiting this enzyme could deliver a great 1-2 punch. This led people to think that grape seed extract could increase testosterone. The proanthocyanidins are digested to give catechins to the body. If these effects are seen with procyanidin B2, but not with the catechins themselves, it is unlikely to work after oral ingestion once the liver and intestines hack away at the proanthocyanidins. And that is what we see in the real world as grape seed extract fails to influence testosterone and estrogen. While initially promising, grape seed extract may ultimately fail to increase testosterone since the in vitro studies may not apply after digestion of grape seed extract. I mentioned that grape seed extract could improve blood flow and potentially reduce signs of inflammation, which is why it’s generally considered protective of your heart and blood vessels. However, when we think of heart healthy we tend to think of the lipid and cholesterol markers. Namely, triglycerides and HDL, LDL, and VLDL cholesterol—how does grape seed extract affect these guys? Outright failures all around in affecting their overall levels. Even when grape seed extract is able to protect LDL from oxidation, it won’t be influencing overall LDL levels. So if you want to take grape seed extract to improve heart health, don’t assume that cholesterol levels would be a good way to measure it. It may improve blood flow and maybe C-reactive (a marker of inflammation) protein, but not the cholesterols or triglycerides. Grape seed extract is not a potent all-around heart health supplement. It improves some parameters, like blood flow, but otherwise fails to improve the lipid profile. Pycnogenol is a brand name that refers to pine bark extract, and it’s often brought up in discussions of grape seed extract. Now, the reason I’m telling you about it now is that grape seed extract and pycnogenol are chemically very similar. So, it’s reasonable to assume that both compounds have similar benefits, and that much of the research on pycnogenol also applies for grape seed extract. Studies show that pycnogenol can improve cognition and reduce joint pain secondary to improvements in blood flow and its antioxidant effects. The benefits of pycnogenol are traced back to its proanthocyanidin content. Now, normally this isn’t sufficient evidence for the replacement since while two things may be called “vitamins,” they can be drastically different. However, both pycnogenol and grape seed extract have the exact same proanthocyanidins! Specifically, they have comparable total level of proanthocyanidins (74-78% for grape seed extract and 65-75% for pycnogenol) and they both contain procyanidin B1 (grape seed extract and pycnogenol citations for that claim) at, give or take, 5% total weight. Procyanidin B2, C1, and others are also present in the two supplements at somewhat comparable levels. Since these are the PACs involved in improving blood flow, and blood flow is confirmed in humans with both supplements by similar means, a comparison is supported. Now, the two supplements aren’t exactly the same. Some compounds have been found in one yet not detected in the other (such as taxifolin in pycnogenol), and at the end of the day grapes are not pine nuts. However, for any purpose that can be traced back to these specific proanthocyanidins they’re pretty similar. And finally, just to clarify, it is these specific proanthocyanidins. Proanthocyanidin is a classification term and sometimes you get cool and unique proanthocyanidins that do funny things. For example, those found in cranberries, which we’ve written about previously, have great evidence for the treatment of UTIs. Pycnogenol also has much more evidence than GSE does and there are some cool things it can do that haven’t yet been traced back to any individual molecule. If those benefits are due to these specific proanthocyanidins, however, then it is very reasonable to assume they apply to grape seed extract, too. Pycnogenol is also unique because a ton of the studies on it are confounded with industry bias. That doesn’t mean the results are invalid, though. The studies that aren’t confounded with industry bias (which are often conducted independently by university scientists with governmental funding) actually confirm the effects. It may very well be a case where the industry didn’t mess with the data. Pycnogenol is bloody expensive to put into a dietary supplement. So expensive that just about no one can use it. This is why most supplements, including ours, use grape seed extract instead. When it comes to improving blood flow, the compounds in pycnogenol that improve blood flow are the exact same molecules in grape seed extract that improve blood flow. The benefits of one are the benefits of the other, and the main difference is that grape seed extract is much cheaper. Supplementation of grape seed extract is generally used in the range of 150 to 300 mg taken once a day. The proanthocyanidin content is at times not listed but it’s rare to find any grape seed extract supplement that doesn’t have at least 50% proanthocyanidins by default; usually it’s 75% or so. While normally we should get into the habit of requesting the exact doses of the exact beneficial bioactives (for example, only taking bacopa that has at least 50 to 55% bacosides listed like in Ascend), grape seed extract seems to be less risky since it’s likely more expensive to remove the proanthocyanidins rather than leave them in. Some studies use up to 1,000 mg of grape seed extract for the same effects, but ultimately, studies that assess lower and higher doses against each other (usually between 100 to 800 mg) don’t really see many differences. That’s why we included 90 mg in our joint supplement, Fortify, and 150 mg in our multivitamin, Triumph. In terms of when and how to take grape seed extract, it doesn’t seem to matter. Studies show no difference when it’s taken with or without food or in the morning or at night; just a single study suggested maybe it was a bit better to take it on an empty stomach, but that’s it. For all intents and purposes, grape seed extract is highly versatile and can be taken any way you want. But, if you want to optimize it, then consider splitting it into two equal doses and take it on an empty stomach. Currently, grape seed extract hasn’t shown any negative side effects in human studies with doses up to 600 mg daily. There was one study designed solely to test how much grape seed extract people can take before side effects kick in. It found that doses of up to 2,500 mg daily (27.7 times the amount in Fortify) over the course of four weeks still failed to show any harm. Unfortunately, grape seed extract is not a supplement that you will be able to “feel” working. It is a subtle boost that may have benefits over the long-term that we simply add to products to help support beneficial effects. So, yeah, don’t expect anything profound from this supplement because you won’t feel anything from it. It works in the background. When it comes to a good “bang for your buck” antioxidant, it’s hard to beat grape seed extract. You’ll often see people oversell the benefits, though, saying it protects against cancer, stops Alzheimer’s, prevents heart disease, and more… all because it’s an antioxidant. The best we can say right now is that it reliably improves blood flow, may improve blood vessel health, and it may have some small benefits for other things as well. It works well, it works on the cheap, and is a great “icing on the cake” to many supplement formulations. All of this is why we decided to include it in our sport multivitamin, Triumph. 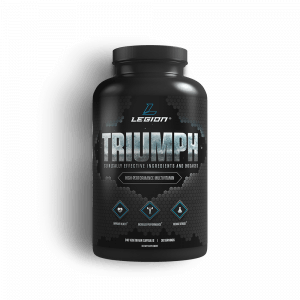 If you’re looking for a good source of grape seed extract to improve blood flow and possibly reduce the risk of heart disease, along with clinically effective dosages of 34 other ingredients that athletes tend to be low in, then you want to try Triumph. What’s your take on grape seed extract supplements? Have anything else to share? Let me know in the comments below!